We’ve been so bombarded by computer viruses, worms, Trojan horses and other malware that we’ve become acclimated to their presence. We subscribe to an anti-virus (AV) offering and hope for the best. Trouble is, AV hasn’t been keeping up. 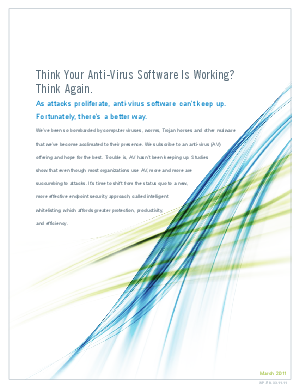 Studies show that even though most organizations use AV, more and more are succumbing to attacks. It’s time to shift from the status quo to a new, more effective endpoint security approach, called intelligent whitelisting, which affords greater protection, productivity, and efficiency.